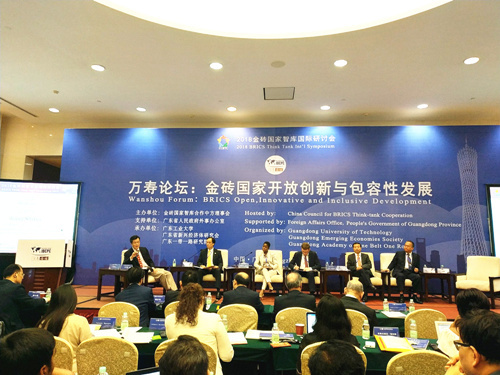 GUANGZHOU—The 2018 BRICS Think Tank International Symposium and Wanshou Forum was held in Guangzhou on April 23. The theme of the symposium was “BRICS Open, Innovative and Inclusive Development.” More than 100 scholars from Brazil, Russia, India and South Africa as well as think tanks and universities nationwide participated in the conference. The world economy is currently showing positive signs but still faces enormous challenges, such as insufficient growth momentum, inadequate economic governance and imbalanced global development. Andre Souza, a senior research fellow from the Institute for Applied Economic Research in Brazil, said that BRICS regional development is the key to reforming the backward global governance system. With the number of BRICS Plus member countries increasing, promoters and initiators of BRICS should cope with such problems as difficulty in overall planning and inconsistent pace of cooperation, Andre said. Zheng Changzhong, director of the State-Building Research Center at Fudan University, said that BRICS may utilize the existing rule mechanism to deal with such behaviors as trade protectionism through counterattack or negotiations, pushing forward the development of global economy. BRICS should enhance cooperation with other countries, improve the level of economic development and seek balance between internal and external development, Zheng said. Jiang Shixue, a specially appointed professor of Shanghai University, said that BRICS have made great contributions to promoting global economic growth, strengthening cooperation among developing countries and facilitating global economic and financial stability. Particularly, financial cooperation is obviously effective in such aspects as the reform of the international currency economic system, BRICS new development banks and arrangements for emergency foreign exchange reserve. In the next phase, deepening cooperation in fields of finance and technological innovation will be the key point of cooperation among BRICS countries, Jiang said. Participants deemed that BRICS should constantly intensify cooperation in the current international economic and political system while effectively safeguarding interests of developing countries. They should pursue mutually beneficial outcomes through openness and cooperation, playing a positive role in creating bright prospects for the global economy.